Yesterday was Mother's Day here in the United States, a day set aside by Congressional Order to honor and celebrate our mothers. It is a day when I always feel a little bit out of the picture because I'm not a mother and it was a conscious choice that I have rarely regretted. I can't, in all honesty, say that I have never regretted not being a mother, but most of the time I am happy with my decision, as selfish as it can be. I came to the decision to not have children when I was quite young. 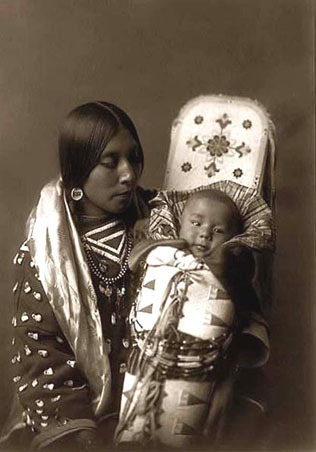 I think it was about the time when I realized that if I had a child, my mother would be hovering over me, smothering me and trying to raise my child "better" than I could. It would lead to more fights and less understanding, increased stress and hidden rage, and it would be so generally uncomfortable that I simply decided that avoiding the situation would be for the best. 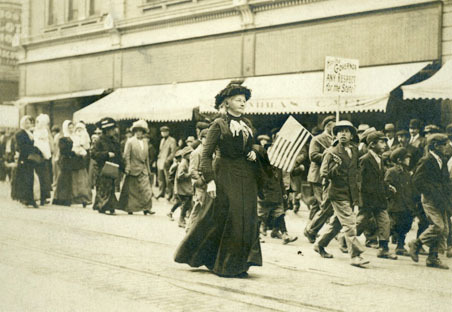 I just love this picture of Mother Jones marching down the streets of Colorado. Let me be clear. I loved my mother. Mainly she was a supportive, talented, and energetic person who generously shared herself with me and my father, opened her house to my friends, and still had time for her crafts and artwork. But I am a person who values my privacy and my solitude, two words that didn't seem to exist in my mother's vocabulary. Anything I was doing was fodder for discussion. Anyone I met could be a linchpin for interrogation later. Any book I was reading was an open target for opinion, welcomed or not. Minor issues? Maybe. But after a lifetime of avoiding these flechettes, I shied away from any other doors of invitation. Thus - no children for me. I hope all of your mothers had a wonderful and well-deserved day of appreciation, and once more I am grateful, in my own way, that I am not one of the marching ranks. Current Location: Chiro today - Yippee! But I am a person who values my privacy and my solitude, two words that didn't seem to exist in my mother's vocabulary. Anything I was doing was fodder for discussion. Anyone I met could be a linchpin for interrogation later. Any book I was reading was an open target for opinion, welcomed or not." --This, exactly. My mom was great in a lot of ways but she would have made one hell of a prosecuting attorney who thinks trials are a blood sport. Since we are nearly the same age, I think it might have been a generational thing with our moms as well. The generational link certainly is possible. I have also found this attitude to be pervasive in those who experienced the Holocaust, so that is another possibility. Whatever the cause, I did not care for the practice. If your mother was similar, you have my sympathy. The regrets are minor and long past. I do feel fortunate that my DH married me knowing that I never wanted children and that it was fine with him. I suspect that we are both a bit too selfish to share our lives so completely with another being. I have always felt very grateful that I was born in an age and society where birth control was available, dependable, and easy to obtain safely. LOL - I am nothing if not stubborn :-) I basically told my parents that I never wanted to hear the "When am I going to be a Grandparent?" speech from them at any time or I would completely sever the already tenuous relationships that we had managed to attain in my adult life. They knew that I wouldn't tolerate it, and they wanted to stay in contact, so it was never mentioned. It may have hurt them, they never said, but I had to make that decision for my own life and felt that I had no choice. Good luck with your own "baby" woes. I think you're a pretty awesome Mom yourself and quite busy as it is without adding another infant to the mix. If you ever decide that YOU and your husband want another child, well...that's another thing entirely. I'm glad to be a puppy-mommy at last. I have loved those 4-footed that I've shared my life with. That kind of child is still one that I have no problem with, and I hope someday to share my life with them again. Choosing not to have children is hardly ever a selfish decision and I cannot really think when it would be regarded as such. Choosing to have a child for the wrong reasons nearly always is. I have to say that I agree with you in the main. There are too many children out there who are being poorly parented that I hope will meet teachers like Dawn and have inspirations like Surgical Steel so that they will chase their rainbows. The one thought that travels through my mind while reading this: you say the word selfish (or imply it). Being single, being married sans children is not denying the world the blessing (or curse) of children, is not being self centered or selfish, but rather the recognition that the individual (or the couple) can and does contribute mightily not just to society but to the world. Not even considering the issues of over-population, but the reality that a parent has to be 24/7 for the child. Want to paint? Can't. Want to write? No time. Want to perform a symphony? Forget it! As a single, never married, never parent and dedicated celibate, I don't think of you or anyone who made your choices as selfish but rather taking the high road toward human enlightenment. And it looks like that you and I discover more and more similarities. What you say about your mother applies to mine too, and Alen is a husband who feels just like me about children so he never insisted on having them. My mother had enough insight to realise that if she was to be called upon to help bring up any grand-children she would try to tell us how we should do it - and backed out of such a relationship; she would be 'granny', be willing to babysit no more than once a month, and be an emergency minder if absolutely necessary. And give advice when asked. I have always been grateful for her making that decision, rather than volunteering to 'help' so that I could return to work. We had a paid child-minder who was wonderful - but never attempted to give me instructions or question me about why or what I was doing! 150 would have been about 700 miles too close! Your comment about species eating their young had me laughing out loud. Too funny, and all too understandable. I am quite amazed that I survived to adulthood given that I was a total snark from about age 13-14 through age 30. Parents have my sympathy when hormones kick in. *hugs* - sorry that the elfling was so far away. Doesn't sound selfish to me! I actually think of not having children as the altruistic option, given that the planet is currently dealing with over-population.